Early Saturday morning, a toxic leak of methyl mercaptan gas (also known as methanethiol) killed four workers at a DuPont chemical plant in La Porte, Texas, just outside of Houston. A fifth worker was hospitalized and released. Yesterday, teams from the EPA, the Texas Commission on Environmental Quality, and the United States Chemical Safety Board (USCSB) gathered to launch an investigation. According to the New York Times, the plant manager confirmed that DuPont will also do its own “top-to-bottom review” of the conditions leading to the fatal accident. 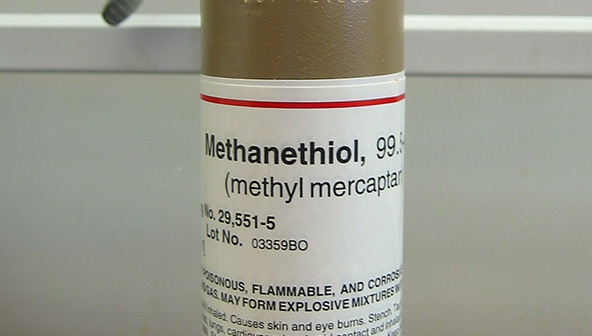 Methyl mercaptan is a known toxic gas, but fatal events arising from leaks are relatively rare. According to the Wall Street Journal, the last major methyl mercaptan event occurred in 2001 when a pipe carrying the gas broke at a Michigan chemical plant. The gas—which is flammable—ignited, resulting in a 200-foot high fireball that killed three employees. The USCSB confirmed that it had filed a request for documents related to DuPont’s methyl mercaptan storage and use. It took DuPont two hours to contain the leak according to a company official. The chemical was not present in quantities posing any danger to the surrounding community, but this was the first thing that first responders were required to assess. Based on events like the Bhopal disaster — and, more recently, the fertilizer plant explosion in West, Texas — in 2013 the Obama administration issued Executive Order 13650, Improving Chemical Facility Safety and Security. The Order seeks greater chemical facility safety and security protocols, and has resulted in greater sharing of information between first responders, federal agencies, local communities, and those who manufacture, store, and use hazardous chemicals. The Order is intended to strengthen preexisting protocols for responding to hazardous chemical risks. For example, since 1990 the EPA’s Risk Management Plan (RMP) Rule has required facilities that use extremely hazardous chemicals develop a Risk Management Plan that is updated and resubmitted to the EPA every five years. The RMP Rule requires employers using hazardous chemicals to consider the risk to employees and local resident within a certain zone around their facilities based on weather patterns and other factors likely to impact catastrophic events. The methyl mercaptan leaked at the La Porte facility is employed in the production of pesticides that kill insects that may attack crops, cotton, and poultry. It is also used in the production of fungicides and jet fuel, according to the Centers for Disease Control. The DuPont plant was storing its methyl mercaptan in liquid form, inside an airtight container. DuPont representatives confirmed that the liquid chemical must have been accidentally exposed to the air, which causes it to transform into a poisonous gas. However, the exact circumstances regarding how this happened are still not known. The 600-acre La Porte facility has been in operation since 1946, and employs hundreds of workers. Prior EPA investigations in 2012 and 2014 had shown the facility to be out of compliance in several areas, and it was hit with $117,000 in penalties. The EPA and USCSB would not confirm a timeline for completing their investigation.